Question: Can you follow-up on last week’s column about condo/townhouse rentals with an analysis on the single-family home rental market in Arlington? Answer: Thank you to ARLnow commenter Southy4Life for requesting that I follow-up last week’s analysis of the condo/townhouse rental market with a similar analysis of the single-family home (SFH) rental market. The good news for those looking closely at the rental stats in Arlington is that the majority of SFH rentals are represented in the MLS data presented below, as opposed to a large percentage of condo/apartment rentals not represented in my data last week because most are handled outside of the MLS (commercial rentals, direct landlord-to-tenant). Just like the condo rental market, there has been very little appreciation in rental rates in Arlington’s SFH home rates, until 2017, which saw a noticeable jump led by 22207, 22205 and 22203. This doesn’t correlate to what we saw in the sales market from 2016 to 2017 so admittedly I don’t know why these three zip codes saw substantial rental growth, while the rest of the Arlington market remained relatively unchanged. 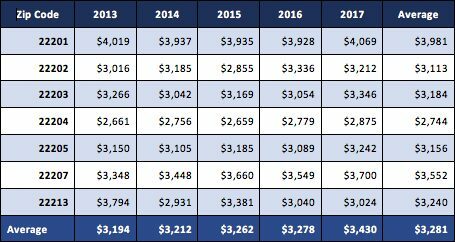 Below is a summary of the average cost of renting a SFH in each Arlington zip code over the last five years. 22206 and 22209 were removed for lack of SFH rental data points. Below is a table of all 3-5 bedroom SFH rentals in Arlington since 2016, broken out by bedroom count and zip code, with rentals in 22206 and 22209 removed for lack of data points. Our team is happy to assist you with rentals, whether you’re a renter or landlord, so feel free to reach out if you need assistance with either! We are happy to put together more specific, personalized data tables for your as well. Newer PostShould You Buy Homeowner’s Title Insurance?